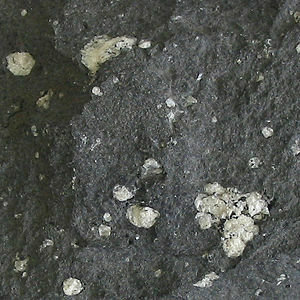 A sample of andesite (dark groundmass) with vesicules filled with zeolite. Diameter of view is 8 centimeters. Andesite is a type of igneous rock that is found in most volcanic regions of the world, especially around volcanoes that line the Pacific Basin. Its main mineral components are plagioclase, pyroxene, and hornblende. The study of andesite has helped scientists understand the geological processes by which this igneous rock can be formed. The term andesite is derived from the Andes mountain range, where specific types of lava were given this name. Andesites are generally found as surface deposits and may therefore be considered the "extrusive" equivalent to diorite, which is formed beneath the Earth's surface (and is thus an "intrusive" or plutonic rock). Andesites are characteristic of subduction tectonic environments in active oceanic margins, such as the west coast of South America. This type of rock is plentiful around volcanoes that line the Pacific Basin. The composition of andesite is classified as "intermediate" among igneous rocks, implying that its silica content is in the range of 52-63 percent. Its texture ranges from aphanitic to porphyritic. The mineral assembly is typically dominated by plagioclase, with pyroxene and/or hornblende. Biotite, quartz, magnetite, and sphene are common accessory minerals. Alkali feldspar may be present in minor amounts. Classification of andesites may be refined according to the most abundant phenocryst. For example, hornblende-phyric andesite indicates that hornblende is the principal accessory mineral within andesite. Dehydration melting of peridotite and fractional crystallization. Melting of subducted slab containing sediments. Magma mixing between felsic rhyolitic and mafic basaltic magmas in an intermediate reservoir before emplacement or eruption. Andesitic magma in island arc regions (that is, active oceanic margins) comes from interplay between the subducting plate and the mantle wedge, the part of the overriding plate above the subducted plate. Water in the subducted oceanic crust "boils off" from the slab by dehydration of hydrated minerals such as amphibole, zeolites, and chlorite. The slab itself, or the overlying mantle wedge, may melt. The water and initial slab melts rise into the mantle wedge, prompting melting of the peridotite to produce a basaltic melt. On its way to the surface, the melt stalls and cools, enabling the fractional crystallization of silica-poor minerals. As a result, the silica content of the remaining melt increases, producing andesitic magma. Basaltic magma may also mix with rhyolitic magma. This usually occurs in continental arc areas such as the Andes, where the high geothermal gradient above the subducted plate, and hydrothermal flows within the mantle wedge may create an underplate of softened, partially molten continental crust of intermediate or felsic composition. Basaltic magmas intruded into this anomalously hot zone will prompt partial melting of the crust, and may mix with these melts to produce intermediate compositions, typically andesite to trachyte in composition. Alternatively, the basaltic melt may heat up the overlying arc, prompting partial melting, and may even assimilate sediments, previous volcanic rocks, and so forth, while undergoing fractional crystallization. These rocks are subordinate due to the difficulty in assimilating sufficient cold material by magmas without cooling to a degree that they become immobile. The resultant composition of andesite and intermediate magmas is based on fractional crystallisation, assimilation, partial melting, and contaminaton by the subducted slab. It may take considerable effort to resolve the individual components. ↑ A rock with aphanitic texture is so fine-grained that its component mineral crystals are not detectable by the unaided eye. A rock with porphyritic texture has large-grained crystals dispersed in a fine-grained groundmass. ↑ The phenocryst refers to the larger, conspicuous crystals within the smaller grained groundmass. Blatt, Harvey, and Robert J. Tracy. 1995. Petrology: Igneous, Sedimentary, and Metamorphic, 2nd ed. New York: W. H. Freeman. ISBN 0716724383. McBirney, Alexander R. 2006. Igneous Petrology, 3rd ed. Jones & Bartlett. ISBN 0763734489. Skinner, Brian J., Stephen C. Porter, and Jeffrey Park. 2004. Dynamic Earth: An Introduction to Physical Geology, 5th ed. Hoboken, NJ: John Wiley. ISBN 0471152285. Subduction Magmas: Island arc magmatism. Experimental and Theoretical Constraints on Peridotite Partial Melting in the Mantle Wedge. This page was last modified on 20 March 2016, at 18:59.